Do you need some nail art inspiration for this season? Get ready to sizzle some magic on your nails with these simple DIY nail art designs. Today we bring you the hottest, craziest and latest nail art trends. These designs have been taken straight from the celebrities, beauty brands and the ramp walk models. So check out our cute and quirky nail art designs that will make you stand out from the rest of the girls of the crowd. So give your nails some pampering and send out your love to them. Get your nail art tools ready! Who says you can get nails as glittery and bedazzling as your jewellery. Plain monochrome nails are just the things of the past. You can pick up your favourite shades and add some embellishments. These embellishments are easily available in the market and on all the leading online beauty stores. So get your own quickly! It’s time to turn your world upside down. No, we’re not asking you to do a headstand. Reverse your conventional French manicure to add some oomph to your regular nails. Pick up the neutral colours to keep the look natural. Also Read: FYI: 5 Nail Paints Men Love on Women! Winged eyeliner and feather nails? Isn’t it a great idea. This manicure is, however, a bit harder than the rest of all. So you can take up this task as a way to hone your skills. You can take some help from your friend and enjoy painting your nails on this girl’s pyjama party. If you like to be elegant and edgy at the same time, then this nail art is made for you. You can paint your nails with the favourite shade of yours. Jazz up your nails by putting some studs of your choice on them. Also Read: How About Having Mirror On Your Nails? Try This Mirror Nail Polish! Ditch your same old summer pastel and try something edgy this time. Create a gradient with two contrasting shades like red and purple to create the ombre nails. The gradient looks intricate and chic. Stained glass intrigues everyone. Wonder what stained glass nails could do. Mimic the intricacy of the beautiful stained glass on your nails and create this stunning manicure. 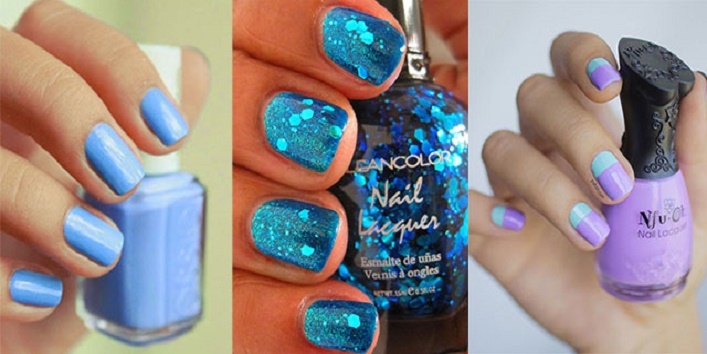 You can add some glitters to add some oomph to your nails. You’ve been out of school for a long time. So what? You can relive the nostalgia by painting your nails in the pattern of your notebook. This adorable nail art has stolen many hearts and will continue doing so forever. Learn to do this nail art and it is the best kind of homework. You can make use of both matte and glossy nail polish to create this look. Divide your nails into two parts. Paint one glossy and the other matte. The result will create a contemporary manicure that will fit with any type of outfit you wear.